The record is made up of 1 file (2 folios). It was created in Dec 1933. It was written in English. The original is part of the British Library: India Office The department of the British Government to which the Government of India reported between 1858 and 1947. The successor to the Court of Directors. Records and Private Papers. 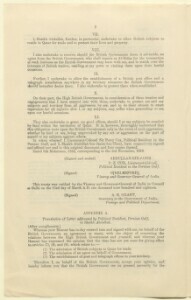 This memorandum, printed by the India Office The department of the British Government to which the Government of India reported between 1858 and 1947. The successor to the Court of Directors. 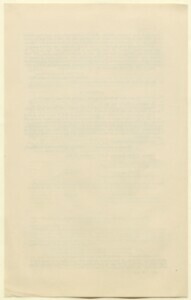 , is a copy of the English text of the 3 November 1913 treaty between Sheikh Abdullah-bin-Jasim-bin-Thani [Sheikh ‘Abdullāh bin Jāsim Āl Thānī], ruler of al-Katar [Qatar], and His Majesty's Government, ratified on 23 March 1918. The preamble to the treaty mentions the 12 September 1868 treaty with Shaikh ‘Abdullāh's grandfather, Shaikh Mohammed-bin-Thani [Muḥammad bin Thānī], followed by eleven articles. 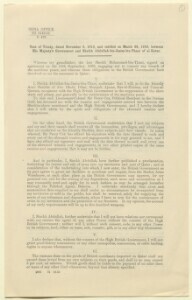 The treaty is signed by Sheikh ‘Abdullāh; Lieutenant-Colonel Percy Zachariah Cox, Political Resident A senior ranking political representative (equivalent to a Consul General) from the diplomatic corps of the Government of India or one of its subordinate provincial governments, in charge of a Political Residency. in the Persian Gulf Historically used by the British to refer to the sea area between the Arabian Peninsula and Iran. Often referred to as The Gulf or the Arabian Gulf. ; Frederic Thesiger, 1st Viscount Chelmsford; and Alfred Hamilton Grant, Secretary to the Government of India, Foreign and Political Department. The text of the treaty is followed by two appendices: 'Appendix A. Translation of Letter addressed by Political Resident A senior ranking political representative (equivalent to a Consul General) from the diplomatic corps of the Government of India or one of its subordinate provincial governments, in charge of a Political Residency. , Persian Gulf Historically used by the British to refer to the sea area between the Arabian Peninsula and Iran. Often referred to as The Gulf or the Arabian Gulf. 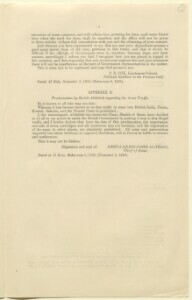 , to Sheikh Abdullah', signed by Cox at Al Bida [al-Bidda‘], and dated 3 November 1916 [6 Muḥarram 1335]; and 'Appendix B. Proclamation by Sheikh Abdullah regarding te Arms Traffic', signed by Sheikh ‘Abdullāh at al-Bida‘, and dated 6 Muḥarram 1334 (3 November 1916). Foliation: The foliation sequence commences at the front cover, and terminates at the inside back cover; these numbers are written in pencil, are circled, and are located in the top right corner of the recto The front of a sheet of paper or leaf, often abbreviated to 'r'. side of each folio.